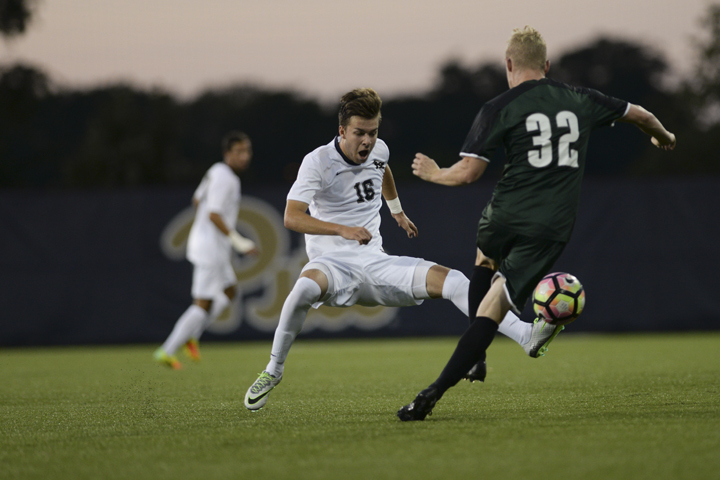 The Pitt men’s soccer team went scoreless for its fourth game in a row after falling 1-0 against Penn State Tuesday night. The Panthers (2-9-2) struggled to keep Penn State’s (5-6-1) offensive powerhouses — midfielder Connor Maloney and forward Dayonn Harris — away from their goal, leaving goalkeeper Mikal Outcalt to consistently keep the team afloat. From the start of the game, the Nittany Lions dominated at Jeffrey Field in State College, Pennsylvania, with two shots within the first five minutes of play — both by Maloney. Outcalt saved the first shot, while the second flew wide of the net. Outcalt continued to foil Penn State’s aggressive offense with another save against Lions midfielder Noah Pilato’s goal attempt in the sixth minute. Pitt’s defensive line seemed to struggle as Maloney flew past them once again, but Outcalt was ready at the goal for his third save of the night. Panther first-year forward Josh Coan garnered a corner kick opportunity in the 12th minute to get the Panthers going, but missed, causing the momentum not to stick. Penn State kept peppering the Pitt goal with shot after shot. In the 19th minute, Harris took his first shot against Outcalt, who continued to keep Pitt locked in a 0-0 game. Aymar Sigue soon followed his teammates with an attempt against Pitt but sent the ball well above the Panthers’ crossbar. After another Maloney and Outcalt face-off, with the Panthers goalie preventing a Lions advantage, Penn State substituted Sigue for first-year forward Frankie De La Camara. This time, it was Harris’ turn to pressure Outcalt. Within a span of five minutes, he took three shots with Outcalt defending two of them and one soaring wide of the net. In search of relief on the pitch, the Panthers made three substitutions. After De La Camara sent a ball wide, Coan took Pitt’s first shot on goal in the 39th minute. Nittany Lion’s keeper Evan Finney made a swift save and sent the ball back into play. In the 40th minute, Penn State’s undeterrable efforts finally paid off. De La Camara sent the ball to Harris, who chipped the ball right over Outcalt’s head for the first goal of the game. After 14 shots against Pitt, the half ended 1-0 with Penn State grasping the lead. The Panthers’ offense continued their plight from the first half of keeping the ball away from Penn State’s offense, but the re-energized Lions did not let up in the second half. Pilato sent up the first shot of the half, but before Outcalt could get a finger on it, the ball bounced off the crossbar. Harris and Maloney carried the Lions with a pair of shots before Pitt decided to start substituting players again in the 59th minute. Pitt’s offense and defense could not keep up with the Nittany Lions on all fronts, and in the 65th minute, the Panthers’ aggravation started to show. Prior to a Penn State penalty kick, Pitt defender Stephane Pierre received a red card, forcing the Panthers to play with only 10 members on the field for the remainder of the game. Outcalt blocked Maloney’s penalty kick, and his following corner kick did not convert to a goal for the Nittany Lions. The final minutes of the game played out with Penn State holding the lead and giving Pitt limited opportunities to take the game back with the final score ending 1-0 in the Nittany Lions’ favor. The Panthers’ performance does not show any promise for the rest of their season. Outcalt saved 12 shots on goal, and the Nittany Lions had 22 shots in the whole game opposed to Pitt’s one. The Panthers will travel to Raleigh, North Carolina, on Saturday, Oct. 15, to try and win their first conference game of the season against North Carolina State at 7 p.m.